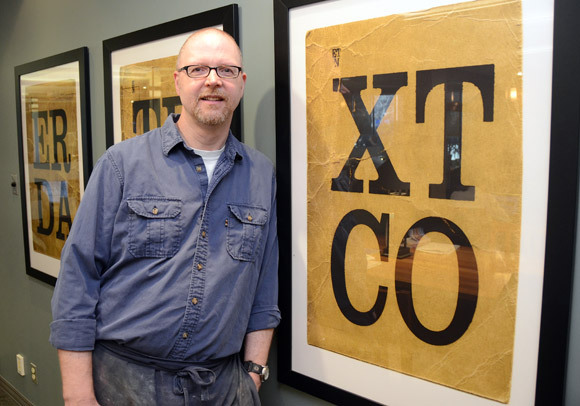 Briar Craig, associate professor of visual arts, has donated six screen prints to the institution’s public art collection. Byron Johnston also donated his work, A Decomposition, to the university. 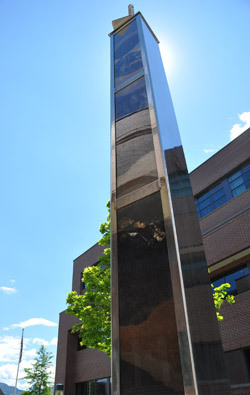 The sculpture was erected between the Arts and Science buildings in 2010 and features a variety of materials in stages of decomposition. Briar Craig wants his art to be more than just something people can look at. He wants his art to be a participatory experience. Craig says each piece of work consists of a “bunch of scrambled letters,” which people are encouraged to unscramble. A Decomposition, a work of art by Byron Johnston, associate professor visual arts, has been officially donated to UBC’s Okanagan campus. The six prints are currently in the library’s Field Reading Room, a fitting placement for art that involves letters and words. “For some strange reason, I always pictured those prints in that place,” he says. Byron Johnston, associate professor visual arts, also donated one of his works, A Decomposition, to the university. The sculpture was erected between the Arts and Sciences buildings in 2010 and features a variety of materials in stages of decomposition. Johnston says he has always found the process of decomposition interesting and wants to draw attention to things people may not normally notice. A Decomposition invites people to look through a peephole at solitary details of adjacent, natural elements. Susan Belton, curator of UBC’s Okanagan campus public art collection, is thrilled to have the pieces become a permanent addition to the art collection that boasts more than 270 original works. The collection includes works by artists of considerable renown such as governor general award-winners Carl Beam and Nobuo Kubota and a number of Inuit artists such as Order of Canada recipient Helen Kalvak. Belton said at any given time, most of the collection can be viewed at various locations across the campus. The complete collection can be viewed at http://gallery.ok.ubc.ca/pac. 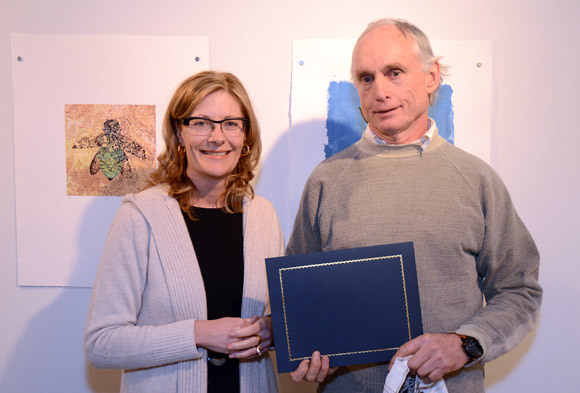 Jackie Podger, associate vice-president of finance and administration, presented Byron Johnston, associate professor visual arts, with a certificate to acknowledge his donation of an original work of art to UBC's Okanagan campus.